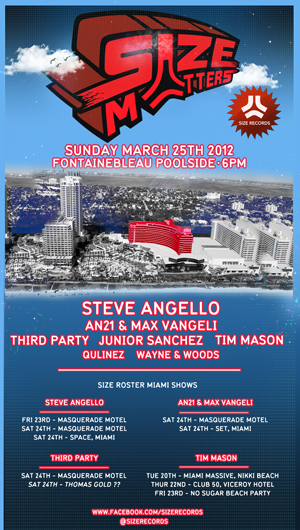 Steve Angello announces the Miami Music Week return of his Size Matters party to the Fontainebleau Poolside on Sunday, March 25. As the name suggests, the 2012 installment of Size Matters is bigger in every way; featuring top flight production and sound and a fantastic line-up of international talent. Size Matters will showcase sets from the entire Size Records label including young talent Wayne Woods, Qulinez, Tim Mason and Third Party; rising stars AN21 & Max Vangeli; the legend Junior Sanchez and Size boss and superstar Steve Angello. There’s no doubt this event will feature tracks that span the entire Size Records catalogue – from the hits you already know to future bombs. The coming months will be filled with brand new music from Size Records – including the long awaited release of Steve Angello’s single ‘Yeah’, the re-launch of the Size Records website and the debut of the Size App for Android and IOS devices.